Background: The use of tourniquets in knee arthroplasty can promote the release of abundant neutrophil elastase from neutrophils, which increases the risk of deep venous thrombosis of the lower extremity. Advanced femoral nerve blocks can decrease the risk of deep venous thrombosis of the lower extremity after knee arthroplasty, but their mechanism of action remains unclear. We assume that the femoral nerve block can effectively suppress the inflammatory reaction and prevent deep venous thrombosis of the lower extremity after knee arthroplasty. Methods/Design: A total of 120 patients undergoing total knee arthroplasty under general anesthesia in the General Hospital of Ningxia Medical University of China will be enrolled in this single-center randomized controlled trial. These patients will be equally and randomly assigned to three groups. In the advanced femoral nerve block group, ultrasound-guided femoral nerve block will be conducted 30 minutes before surgery. In the conventional femoral nerve block group, ultrasound-guided femoral nerve block will be carried out at consciousness after surgery. In the intravenous analgesia group, an analgesia pump will be used to relieve pain after surgery. The primary outcomes will be the changes in the levels of serum thrombosis-related inflammatory factors (neutrophil elastase, thrombin-antithrombin III complex, D-dimers, C-reactive protein, tumor necrosis factor-α, interleukin-1, interleukin-6, and interleukin-8) immediately after entering the operating room; 30 and 60 minutes after application of the tourniquet; 30 minutes after removal of the tourniquet; and 12, 24 and 48 hours after surgery. The secondary outcomes measures will be the Ramsay Sedation Scale score, visual analogue scale score, times until initial and complete effect of the block, muscle strength rating, blood loss, and color Doppler ultrasound examination results of the lower extremity veins. Discussion: We hope to identify the clinical advantages of advanced femoral nerve block for total knee arthroplasty and determine whether deep venous thrombosis of the lower extremity after knee arthroplasty can be prevented by inhibiting the release of abundant neutrophil elastase and suppressing the inflammatory reaction. Trial registration: ClinicalTrial.gov identifier: NCT02411097; registered on 20 March 2015. Ethical approval: Written approval for this project was obtained from the Ethics Committee of the General Hospital of Ningxia Medical University of China. All patients or their family members will be informed of the protocols and will provide written informed consent. Our study is in accordance with the guidelines of the Declaration of Helsinki, formulated by the World Medical Association. Total knee arthroplasty is considered an effective therapeutic tool to lessen pain and improve joint function in patients with advanced knee osteoarthritis. A knee prosthesis can be used to replace a severely injured knee surface during total knee arthroplasty and thus eliminate pain, correct malformation, and restore the stability and range of motion (Losina et al., 2009; Ibrahim et al., 2013). A continuous femoral nerve block for analgesia after total knee arthroplasty has been shown to effectively lessen pain and reduce the residence time in the recovery room (Motamed et al., 2009). Under adequate analgesia, early rehabilitation training can easily induce movement of the affected extremity, help to prevent postoperative adhesions and lower extremity venous thrombosis, and reduce cardiovascular and pulmonary complications produced by long-term bed rest (Sinha et al., 2012). Therefore, effective analgesia is beneficial for timely and effective rehabilitation training. Since the development of the ultrasonic technique, the application of visualization has greatly improved the accuracy of positioning of the nerve block. Ultrasonic guidance allows for clear positioning of the femoral nerve, accurate placement of the conduit front on the femoral nerve surface, and assurance of even distribution of the local anesthetic surrounding the femoral nerve to increase the block effect on the femoral nerve (Casati et al., 2007). Nerve blocks are convenient and inexpensive and allow the application of perioperative opioids to be decreased. Additionally, the femoral nerve block has become the recommended analgesic model after total knee arthroplasty (Bauer et al., 2012). Deep venous thrombosis of the lower extremity is one of the most common complications in the perioperative period of total knee arthroplasty (Geerts et al., 2004; Tai et al., 2011). Prevention of thrombosis is very important during administration of analgesia with a continuous femoral nerve block after total knee arthroplasty. What is the main cause of thrombosis in the perioperative period after total knee arthroplasty? First, many serological markers are currently considered to be associated with lower extremity thrombosis after total knee arthroplasty, such as neutrophil elastase, thrombin-antithrombin III complex (TAT III), and D-dimers. Several studies have shown that C-reactive protein (CRP), tumor necrosis factor-α (TNF-α), interleukin (IL)-6, IL-8, and IL-10 play very important roles in the development of acute deep venous thrombosis of the lower extremity. Overexpression of neutrophil elastase will damage the body tissue and matrix, including destruction of the vessel wall; neutrophils are more prone to leaking from blood vessels, concentrating at the site of inflammation, and releasing IL-8 and TNF-α (van Aken et al., 2002; Krieger et al., 2004; Roumen-Klappe et al., 2009; Wojcik et al., 2011). Numerous studies have demonstrated that CRP, IL-6, IL-8, and TNF-α are involved in acute deep venous thrombosis of the lower extremity (Fox et al., 2005; Beckers et al., 2010). Second, the use of a tourniquet slows the blood flow of the distal extremity, causes ischemia/hypoxia and vascular endothelial injury, and results in a hypercoagulable state of the blood (Kato et al., 2002). After removal of the tourniquet, skeletal muscle ischemia/reperfusion injury further aggravates the injury to the vascular endothelial cells, impairs the procoagulant-anticoagulant balance, and increases the risk of deep venous thrombosis. Katsumata et al. (2005) considered that the use of a tourniquet during total knee arthroplasty could contribute to the release of a great amount of neutrophil elastase from neutrophils, rapidly increase and concentrate leukocytes and platelets in the blood, and increase the risk of deep venous thrombosis of the lower extremity. These findings suggest that inhibiting inflammatory factors can exert potential preventive effects on venous thrombosis of the lower extremity. Based on the above ideas, we will perform ultrasound-guided advanced femoral nerve blocks in patients who will undergo time-selective total knee arthroplasty under general anesthesia. Comparative observation will be used to identify the clinical advantages of an advanced femoral nerve block in total knee arthroplasty. By detection of neutrophil elastase, TAT III, D-dimers, CRP, TNF-α, IL-1, IL-6, and IL-8 and monitoring with lower extremity venous ultrasonography, this trial will identify whether an advanced femoral nerve block can prevent deep venous thrombosis of the lower extremity by suppressing excessive release of neutrophil elastase and the inflammatory reaction. A total of 120 patients who will undergo time-selective total knee arthroplasty under general anesthesia in the General Hospital of Ningxia Medical University of China will be recruited to participate in the study by advertisement through the hospital website. The inclusion criteria are 18- to 85-year-old male and female patients who will undergo time-selective total knee arthroplasty under general anesthesia. Patients and their family members will provide written informed consent. Patient randomization will be conducted by Xin-li Ni using SPSS 19.0 software (IBM Corp., Armonk, NY, USA). All patients will be assigned a number. The starting point and order of sampling will be arbitrarily determined on a random number table. The number of samples will be selected from the random number table. All 120 patients will be randomly divided into 3 groups: the advanced femoral nerve block group, conventional femoral nerve block group, and intravenous analgesia group (n = 40 each). In the advanced femoral nerve block group, an ultrasound-guided femoral nerve block will be conducted 30 minutes before surgery. In the conventional femoral nerve block group, an ultrasound-guided femoral nerve block will be carried out at consciousness after surgery. An analgesia pump will be used in patients of the above two groups after successful catheterization and obtaining a satisfactory effect of the femoral nerve block. In the intravenous analgesia group, an analgesia pump will be used in patients with stable vital signs after surgery. The analgesia pump will be prepared as follows: patient's body weight × 2 μg sufentanil diluted to 100 mL; background infusion rate, 2 mL/h; bolus, 0.5 mL; lock time, 30 minutes. The dispensing protocol will be as follows: 0.4% ropivacaine, 112 mL; load, 15 mL (already injecting during operation); background infusion rate, 2 mL/h; bolus, 0.5 mL; lock time, 30 minutes. Patient-controlled analgesia will be performed once at 15 minutes before functional exercises in both groups; the continuous analgesia time will be 2 days (Bauer et al., 2012). A flow chart of the trial is shown in [Figure 1]. Patients will be placed in the supine position with abduction and 15° external rotation of the affected extremity. A portable ultrasound system (Terason 2000+; Terason, Burlington, MA, USA) will be used with a high-frequency linear array probe (7-13 MHz). This probe will be placed 2 cm inferior to the inguinal ligament. The long axis will be perpendicular to the longitudinal axis of the thigh. When the cross-sectional images of the femoral vein, femoral artery, and femoral nerve are visible, needling will be conducted from the outer thigh skin using a 22-G nerve stimulation needle (Stimuplex D; B. Braun Melsungen AG, Melsungen, Germany) coated with an arterial puncture needle (REF682245; Becton Dickinson, Franklin Lakes, NJ, USA). The puncture needle along the ultrasound scanning plane will enter toward the medial wall at a 30° to 45° angle with the skin. If no blood is observed during snuff back at the femoral nerve from the surface of the sartorius to iliopsoas, a 15-mL load will be infused. The water separation technique will be utilized to expand the interspace surrounding the femoral nerve, and catheterization will then be performed. The length of the catheter left around the femoral nerve will be 1.0 to 2.0 cm. A small amount of physiological saline will then be infused through the catheter to observe the diffusion. If the diffusion remains around the nerve, the catheter will be kept in place. When the effect of the femoral nerve block is satisfactory, the analgesia pump will be connected. The primary outcomes will be the serum levels of thrombosis-related inflammatory factors (neutrophil elastase, TAT III, D-dimers, CRP, TNF-α, IL-1, IL-6, and IL-8) (immediately after entering the operating room; 30 and 60 minutes after application of the tourniquet; 30 minutes after removal of the tourniquet; and 12, 24, and 48 hours after surgery). The secondary outcomes will be the Ramsay Sedation Scale score, visual analogue scale score, times until initial and complete effect of the block, muscle strength rating, blood loss, and color Doppler ultrasound examination results of the lower extremity veins (2, 7 days post surgery). The chart to be used for evaluation of the outcome measures is shown in [Table 1]. Any adverse events that occur during the trial will be carefully evaluated and recorded, including abnormalities in laboratory inspection. The nature, severity, and drug correlation of all adverse events will be identified and strictly recorded on case report forms. The time, number, degree, and processing measures of adverse reactions and complications will be recorded after administration of the nerve block. The types of adverse reactions (7 days post surgery) are dizziness, itching, nausea, vomiting, urinary retention, hypotension, and tachycardia. The types of complications are piercing of the vessel, paresthesia, and local anesthetic toxicity. Adverse events (7 days post surgery) will be described as follows. First, laboratory data will be classified according to whether they are normal. The numbers of normal and abnormal cases in the trial and control groups will be determined before and after treatment. Adverse events will then be described using the incidence. The specific performance, degree, and drug relationships of all adverse events in the three groups will be described in detail. Safety will be judged as follows. (1) Certainly related: the reaction appears consistent with the known type of reaction. The reaction can improve after termination and appears when the test is repeated. (2) Possibly related: the reaction is consistent with the known type of reaction. The patient's clinical status or treatment methods during the trial probably caused the reaction. (3) Possibly unrelated: the reaction is not totally consistent with the known type of reaction. The patient's clinical status or treatment methods during the trial probably caused the reaction. (4) Unrelated: the reaction is not consistent with the known type of reaction. The patient's clinical status or treatment methods during the trial probably caused the reaction. The reaction disappears when patient's status improves or other treatment stops. The reaction appears when other treatment methods are repeatedly used. (5) Cannot be assessed: the reaction is similar to the known type of reaction. The patient's clinical status or treatment methods during the trial probably caused the reaction. The case observation form from each trial center will be collected after assessment by the inspectors, and then sent to a lead institution for data processing. After determining the test protocol, statistics professionals will make a statistical analysis proposal upon consultation with the principal investigator. The data on the case report forms will be doubly recorded by two persons and locked in the databank after ensuring the accuracy of all data. statistical analysis will be performed using SAS 9.0 software (SAS Institute, Cary, NC, USA). First, the demographic characteristics of the patients in both groups will be analyzed to investigate the equilibrium and comparability of the two groups. Second, the effectiveness index and safety index will be compared between the two groups. The measurement data will include the number of effective data, mean, standard deviation, minimum value, lower quartile (q1), median, upper quartile (q3), and maximum value. The numeration data will include the corresponding frequencies or percentages. Qualitative data will be compared among the three groups using Fisher's test. Quantitative data (mean, SD) normally distributed and with homogenous variance will be analyzed using univariate or multivariate analysis of variance. A nonparametric test or approximate test (such as Tamhane's T2 method) will be used if heterogeneity of variance is present. Abnormally distributed measurement data (lower quartile, median, and upper quartile) will be analyzed using the Kruskal-Wallis rank sum test. Baseline equilibrium and comparability will be compared among the groups. The serum levels of thrombosis-related inflammatory factors (neutrophil elastase, TAT III, D-dimers, CRP, TNF-α, IL-1, IL-6, and IL-8) will undergo normality and homogeneity of variance testing. Data normally distributed and with homogenous variance will be analyzed using repeated measures analysis of variance. The degree of sedation will be assessed using McNemar's chi-square test. The visual analogue scale score and recorded time in each group will be compared using the Kruskal-Wallis rank sum test. Adverse reactions and the incidence of complications will be compared using the chi-square test. A two-sided test will be used for statistical analysis. A value of P < 0.05 will be considered statistically significant. Inspectors will visit the test institutions regularly or according to the actual situation to monitor the clinical quality. Specifically, the inspectors will visit before the trial to confirm that the test institution has appropriate conditions with respect to staffing and training, various trial-related inspections (serum detection, Ramsay sedation score, visual analog scale score, block onset and full onset time record, muscle strength rating, blood loss record and venous color Doppler ultrasonography of the lower extremity), a well-equipped laboratory. They will also visit during the trial to monitor the implementation of the protocols, confirm that all patients provide written informed consent prior to the test, ensure the identification and condition of the subjects, the eligible patients enrolled, the integrity and authenticity of all data recorded, and confirm that all adverse events are reported within the allotted time and recorded. Advanced analgesia (block) refers to analgesia that is conducted before perioperative noxious stimuli to prevent central nervous system excitability induced by these noxious stimuli, relieve central and peripheral sensitization during noxious stimuli, delay or suppress stress reactions (Katz et al., 2011), and exert protective effects of analgesia. The continuous femoral nerve block has gradually become a hot topic in the field of analgesia after total knee arthroplasty. Katz et al. (2011) showed that advanced analgesia can effectively inhibit the inflammatory reaction. However, no studies have reported whether an advanced femoral nerve block can inhibit the excessive release of intraoperative neutrophil elastase. Moreover, Asakura et al. (2011) suggested that the advanced femoral nerve block can reduce the occurrence of deep venous thrombosis in the lower extremity after total knee arthroplasty, but its mechanism of action remains unclear. XLN, YC, SQ, GM, and JHM conceived and designed the test procedure. XLN and YC wrote and revised the paper and approved the final version of the paper for publication. Ament R (1979) Origin of the ASA classification. Anesthesiology 51:179. Asakura Y, Tsuchiya H, Mori H, Yano T, Kanayama Y, Takagi H (2011) Reduction of the incidence of development of venous thromboembolism by ultrasound-guided femoral nerve block in total knee arthroplasty. Korean J Anesthesiol 61:382-387. Bauer M, Wang L, Onibonoje OK, Parrett C, Sessler DI, Mounir-Soliman L, Zaky S, Krebs V, Buller LT, Donohue MC, Stevens-Lapsley JE, Ilfeld BM (2012) uous femoral nerve blocks: decreasing local anesthetic concentration to minimize quadriceps femoris weakness. Anesthesiology 16:665-672. Baxter GM, McKechnie S, Duffy P (1990) Colour Doppler ultrasound in deep venous thrombosis: a comparison with venography. Clin Radiol 42:32-36. Beaulieu P, Babin D, Hemmerling T (2006) The pharmacodynamics of ropivacaine and bupivacaine in combined sciatic and femoral nerve blocks for total knee arthroplasty. Anesth Analg 103:768-774. Beckers MM, Ruven HJ, Haas FJ, Doevendans PA, ten Cate H, Prins MH, Biesma DH (2010) Single nucleotide polymorphisms in inflammation-related genes are associated with venous thromboembolism. Eur J Intern Med 21:289-292. Casati A, Fanelli G, Magistris L, Beccaria P, Berti M, Torri G (2001) Minimum local anesthetic volume blocking the femoral nerve in 50% of cases: a double-blinded comparison between 0.5% ropivacaine and 0.5% bupivacaine. Anesth Analg 92:205-208. Casati A, Baciarello M, Di Cianni S, Danelli G, De Marco G, Leone S, Rossi M, Fanelli G (2007) Effects of ultrasound guidance on the minimum effective anaesthetic volume required to block the femoral nerve. Br J Anaesth 98:823-827. Domingo-Triadó V, Selfa S, Martínez F, Sánchez-Contreras D, Reche M, Tecles J, Crespo MT, Palanca JM, Moro B (2007) Ultrasound guidance for lateral midfemoral sciatic nerve block: a prospective, comparative, randomized study. Anesth Analg 104:1270-1274. Ekdahl C (1990) Muscle function in rheumatoid arthritis. Assessment and training. Scand J Rheumatol Suppl 86:9-61. Fox EA, Kahn SR (2005) The relationship between inflammation and venous thrombosis. A systematic review of clinical studies. Thromb Haemost 94:362-365. Geerts WH, Pineo GF, Heit JA, Bergqvist D, Lassen MR, Colwell CW, Ray JG (2004) Prevention of venous thromboembolism: the Seventh ACCP Conference on Antithrombotic and Thrombolytic Therapy. Chest 126:338S-400S. Gross JB (1983) Estimating allowable blood loss: corrected for dilution. Anesthesiology 58:277-280. Ibrahim MS, Khan MA, Nizam I, Haddad FS (2013) Peri-operative interventions producing better functional outcomes and enhanced recovery following total hip and knee arthroplasty: an evidence-based review. BMC Med 11:37. Kato N, Nakanishi K, Yoshino S, Ogawa R (2002) Abnormal echogenic findings detected by transesophageal echocardiography and cardiorespiratory impairment during total knee arthroplasty with tourniquet. Anesthesiology 97:1123-1128. Katsumata S, Nagashima M, Kato K, Tachihara A, Wauke K, Saito S, Jin E, Kawanami O, Ogawa R, Yoshino S (2005) Changes in coagulation-fibrinolysis marker and neutrophil elastase following the use of tourniquet during total knee arthroplasty and the influence of neutrophil elastase on thromboembolism. Acta Anaesthesiol Scand 49:510-516. Katz J, Clarke H, Seltzer Z (2011) Review article: Preventive analgesia: quo vadimus? Anesth Analg 113:1242-1253. Krieger E, van Der Loo B, Amann-Vesti BR, Rousson V, Koppensteiner R (2004) C-reactive protein and red cell aggregation correlate with late venous function after acute deep venous thrombosis. J Vasc Surg 40:644-649. Losina E, Walensky RP, Kessler CL, Emrani PS, Reichmann WM, Wright EA, Holt HL, Solomon DH, Yelin E, Paltiel AD, Katz JN (2009) Cost-effectiveness of total knee arthroplasty in the United States: patient risk and hospital volume. Arch Intern Med 169:1113-1121. 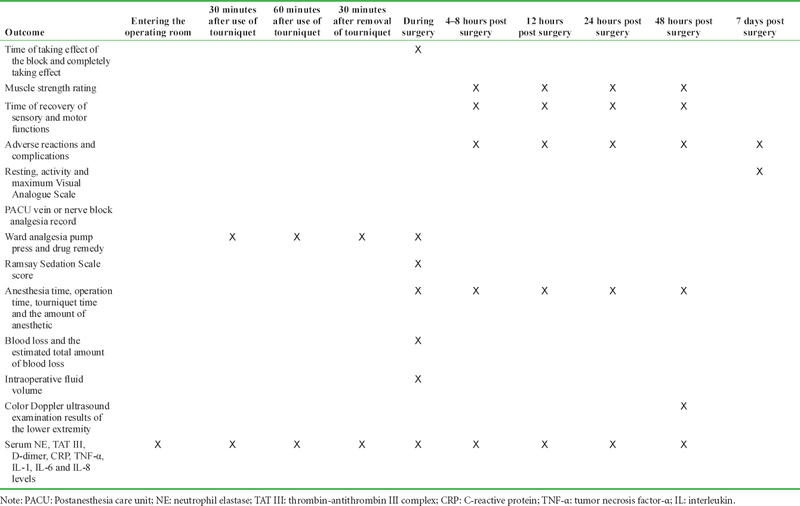 Motamed C, Combes X, Ndoko SK, Dhonneur G (2009) Effect of pre-incisional continuous regional block on early and late postoperative conditions in tibial osteotomy and total knee arthroplasty. Open Orthop J 3:22-26. Roumen-Klappe EM, Janssen MC, Van Rossum J, Holewijn S, Van Bokhoven MM, Kaasjager K, Wollersheim H, Den Heijer M (2009) Inflammation in deep vein thrombosis and the development of post-thrombotic syndrome: a prospective study. J Thromb Haemost 7:582-587. Sinha SK, Abrams JH, Arumugam S, D'Alessio J, Freitas DG, Barnett JT, Weller RS (2012) Femoral nerve block with selective tibial nerve block provides effective analgesia without foot drop after total knee arthroplasty: a prospective, randomized, observer-blinded study. Anesth Analg 115:202-206. Tai TW, Lin CJ, Jou IM, Chang CW, Lai KA, Yang CY (2011) Tourniquet use in total knee arthroplasty: a meta-analysis. Knee Surg Sports Traumatol Arthrosc 19:1121-1130.
van Aken BE, Reitsma PH, Rosendaal FR (2002) Interleukin 8 and venous thrombosis:evidence for a role of inflammation in thrombosis. Br J Haematol 116:173-177. Wojcik BM, Wrobleski SK, Hawley AE, Wakefield TW, Myers DD Jr, Diaz JA (2011) Interleukin-6: a potential target for post-thrombotic syndrome. Ann Vasc Surg 25:229-239.